The Hybrid version of Canada’s 2018 Car of the Year hits dealerships at the end of April. The 2018 Accord Hybrid is the latest addition to Honda’s electrified vehicles and joins Honda’s award-winning 10th generation Accord Lineup. Not only is it a pleasure to drive, it has ample cargo and cabin space for improved practicality. With fuel prices on the rise, hybrid models are becoming an attractive option for car buyers. The 2018 Accord Hybrid is lower, wider and lighter than its predecessors. Drivers don’t have to worry about a large battery taking up trunk space with this model. The battery in the 2018 Accord Hybrid is more compact and under the rear floor to allow for maximum trunk space. The Accord is also now equipped with boosted engines. Depending on the trim level, the car now has either a 1.5 or 2.0 turbocharged engine. The Hybrid model offers the same standard equipment that other Hondas do. 17-inch alloy wheels, LED low-beam headlights and taillights, dual-zone climate control, smart-entry with push-button start, 7-inch TFT driver’s metre and a multi-angle rearview camera are all equipped with this model. The 2018 Accord Hybrid possesses the Honda Sensing® Suite, which has driver-assistive technologies to help keep drivers safe on the road. The suite includes Adaptive Cruise Control, Low-Speed Follow, Collision Mitigation Braking System™, Road Departure Mitigation, Lane Departure Warning and Traffic Sign Recognition. Wheel-mounted Deceleration Selectors help maximize energy generation allowing the driver to toggle between four levels of regenerative braking performance. This helps to reduce stress on the brakes while simultaneously increasing battery charging. The 2018 Accord Hybrid reduces its carbon footprint while using 5.1 L per 100 km. The car is powered by Honda’s third generation of two-motored hybrid powertrain system that leads to a system output of 212 horsepower. 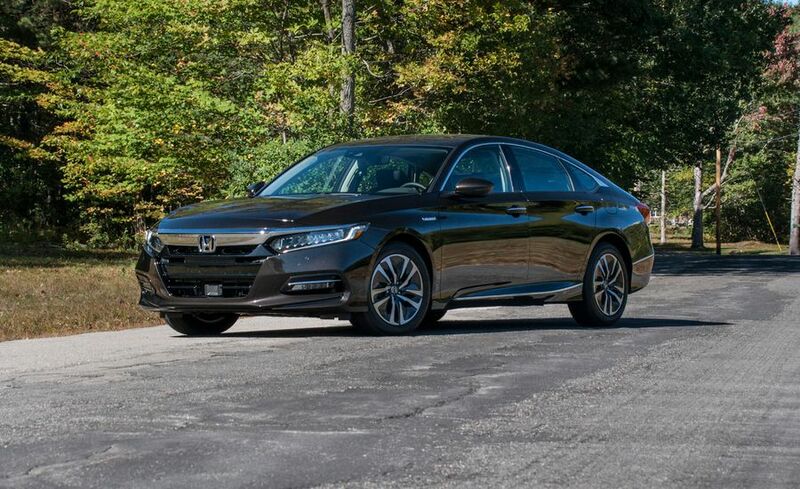 Contact Henley Honda for information on the 2018 Honda Accord Hybrid. The manufacturer’s suggested retail price is $33,090 for the Hybrid trim and $39,790 for the Hybrid Touring trim. Visit us to learn more about the features of the 2018 Honda Accord Hybrid at 303 Lake St. in St. Catharines.